In Winnipeg, on Friday, September 20th, 2014, the Canadian Museum of Human Rights (CMHR) opens its doors up to the world. 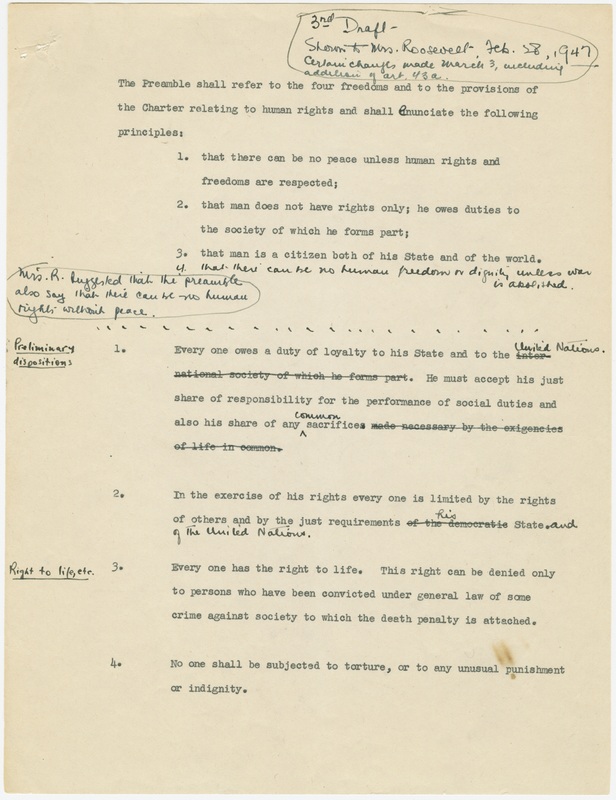 McGill University Archives (MUA) is honoured to play a small part in helping to showcase the Universal Declaration of Human Rights and the author of the original draft, McGill Professor of Law, John Peters Humphrey. 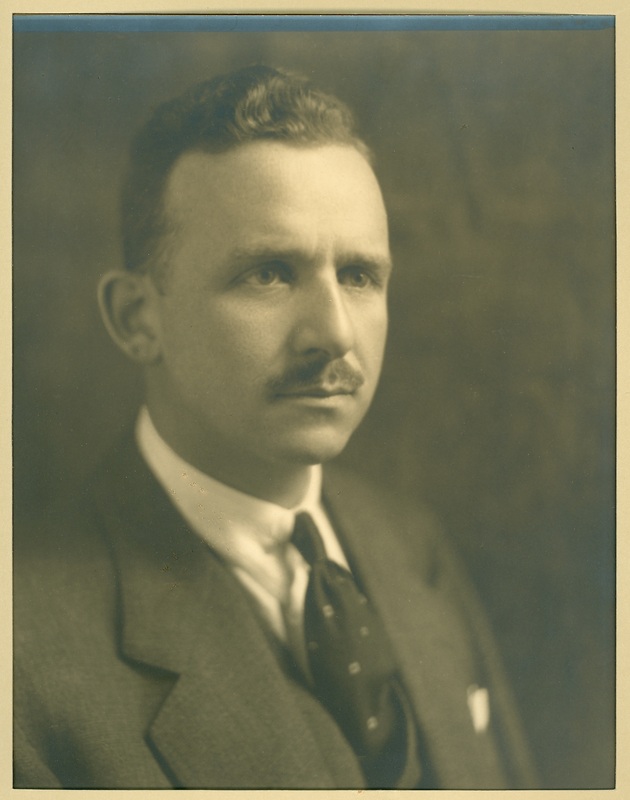 John Peters Humphrey was born on April 30, 1905 in Hampton, New Brunswick. He graduated from McGill University in 1925, with a Degree in Commerce, as well as with a Bachelor of Arts (1927) and a Bachelor of Law (1929). Following his graduation from Law, Humphrey was awarded a fellowship to study in Paris. After the fellowship, Humphrey returned to Montreal and practiced law for five years before accepting a teaching position at McGill. He also enrolled in a Master of Law specializing in international law. During this time Humphrey met Henri Laugier, who would later become the Assistant Secretary-General to the United Nations. In 1946, Henri Laugier appointed Humphrey as the first Director of the United Nations Division of Human Rights, within the United Nations Secretariat. During this time, Humphrey drafted the Universal Declaration of Human Rights, which was unanimously adopted on December 10, 1948. The Commission, which adopted the Declaration, was chaired by Eleanor Roosevelt, who dubbed the Declaration “the international Magna Carta for all mankind”. In addition to the Universal Declaration of Human Rights, Humphrey oversaw the implementation of over sixty international conventions and constitutions for dozens of countries. He worked at the United Nations for approximately 20 years, retiring in 1966, and returning to McGill to continue teaching in Law. In 1974, Humphrey was made an Officer of the Order of Canada, for “recognition of his contributions to legal scholarship and his world-wide reputation in the field of human rights”. John Peters Humphrey died on March 14, 1995. He was 89 years old. How did Humphrey’s materials make their way to the Canadian Museum of Human Rights? About two years ago, representatives from the museum contacted McGill University Archives to discuss the project. After looking at the listing of materials, it was decided that the items to be displayed at the Grand Opening include three pages from the early handwritten draft of the Universal Declaration of Human Rights and Humphrey’s Order of Canada medal. 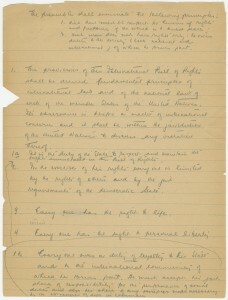 The handwritten pages are the earliest known draft of the Declaration and also contain some of Humphrey’s thoughts as he was drafting it. The Order of Canada medal was given to Humphreys for his work on this. The Universal Declaration of Human Rights is of great significance. It serves as a seminal source for many other similar declarations and human rights documents, and is now part of the customary law of nations. It is the standard to affirm a person’s dignity and worth, and is an expression of the world’s commitment to freedom. The pages and medal were sent to the Museum in July, 2014 and are on loan for 6 months and one year respectively. Most of the material is certified under the Canadian Cultural Property Export Review Board (CCPERB), which means that the material is recognized by the Canadian government as having outstanding significance and national importance to Canada. Over this period, MUA also supplied the CMHR with several images for the Human Rights exhibit and the Grand Opening as well as for an app that will be available to visitors as they tour the newly built landmark. The Archives has approximately 12 metres or 36 cubic boxes of textual material, along with photographs, a plaque, and Humphrey’s Order of Canada medal. The textual material consists of his diaries, correspondence, notes, lectures, articles and a draft book. 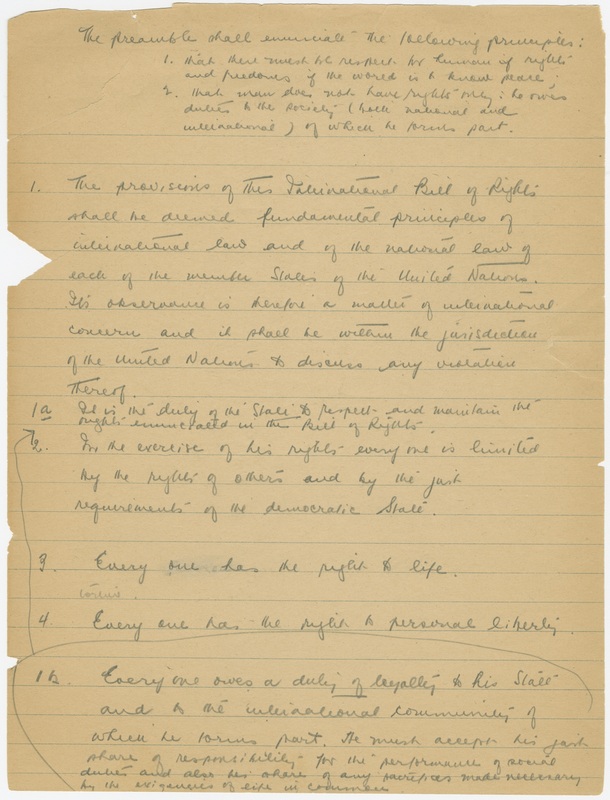 There are also five early drafts or versions of the Universal Declaration of Human Rights. The John Peter Humphrey fonds are open to the public and can be accessed by contacting the Archives Reference Desk at refdesk.archives@mcgill.ca. Interested parties can also call 514-398-4711 to make an appointment to view the records in the Reading Room. The finding aid for the fonds is also available in the Reading Room, which contains a more detailed listing of material. Archives staff members are always happy to answer questions. Learn more about John Peters Humphrey on the McGill Pioneers site here and on the MUA’s dedicated website called John Peters Humphrey, Citizen of the World here. The John P. Humphrey United Nations Collection, housed on the 2nd floor of the Nahum Gelber Law Library, is devoted to monographs and other material on the United Nations with a special emphasis on the international law of human rights. McGill Emeritus Librarian John Hobbins has published extensively on John Peters Humphrey. 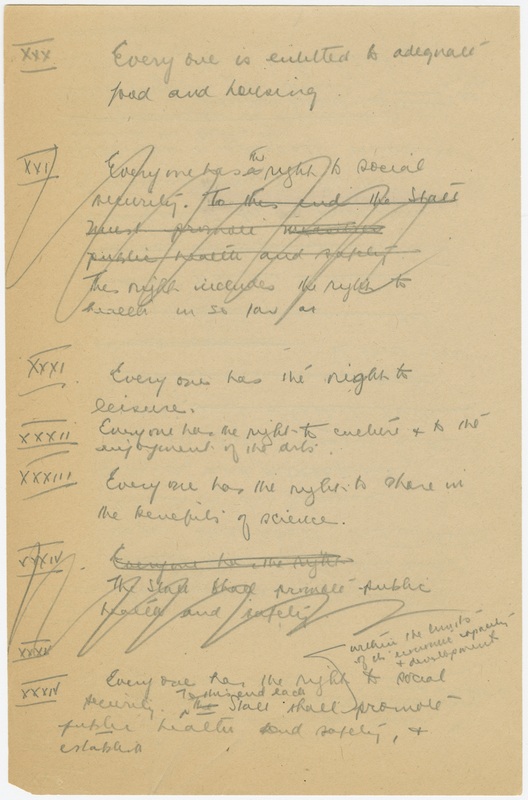 Hobbins has published parts of Humphrey’s diaries, along with several articles about Humphrey and human rights endeavours at the United Nations. Finally, McGill University holds an annual lecture in his honour. The John P. Humphrey Lectureship in Human Rights explores the role of international law and organizations in worldwide protection of human rights. And don’t worry if you can’t make it to the Canadian Museum of Human Rights in person, the Universal Declaration of Human Rights and John Peters Humphrey are highlighted online on the CMHR website here.